Question: What do you think is the coolest fly-fishing destination that most anglers don’t know about? I’m not asking you to reveal any secret spots, just under-publicized places more anglers should consider. 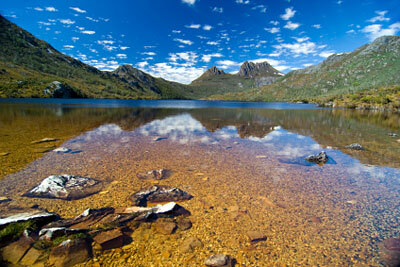 Dove Lake, Tasmania. Julie Camilleri photo. Answer: Well, I know what my answer would be: Tasmania. This island off the southern coast of Australia features unique geography that offers several different trout fisheries, from the huge reservoirs and shallow lakes of the often desolate Central Plateau to the rushing rivers of the low country. There are few places in the world where you can sight-fish to cruising wild trout over 10 pounds, a sport which the locals call “polaroiding.” Plus, the landscape is spectacular and varied, and you have a good chance of seeing strange animals such as the echidna and the tiger snake. The British first brought trout to Tasmania in the 1860s, when it took three attempts to keep the eggs on ice on the journey around Cape Horn. Salmon Ponds, the oldest trout hatchery in the Southern Hemisphere lies just north of the city of Hobart. But despite such a long history of fine trout fishing, Tasmania remains relatively unknown as an angling destination outside Australia. You can read about my trip to Tasmania on MIDCURRENT. To get some other perspectives, I asked a random sampling of fly-fishing world travelers for their choices. Jim Klug of Yellow Dog Flyfishing Adventures: I would say that for salt water, you would have to include Los Roques (known, but still visited by a small number of anglers each year), the Seychelles (incredible GT fishing and super-unusual species like milkfish and triggerfish), and maybe the Bay Islands of Honduras (probably the best value and cheapest costs for any international saltwater trip). For freshwater, I am going to say the golden-dorado fishing in the north of Argentina. Another vote would be the pike, walleye and lake trout on the fly-in places like Wollaston Lake, Saskatchewan. Henry Gilbey, English writer and photographer: The southern tip of Angola. I have seen a photo of a 100-pound kob (kabeljou) taken on a fly from the mouth of the Kunene river. It’s the one place in the world I most want to go. Ken Morrish of Flywater Travel: I might need to go with Jurassic Lake (Lago Strobel), in Argentina for monster rainbows. Brian O’Keefe, photographer and editor of Catch magazine: Do-it-yourself trips to the Caribbean coast of the Yucatan Peninsula, especially a DIY flats camp on the south side of Espirito de Santos Lagoon. E. Donnell Thomas, sporting writer: Melville Island, Australia, for barramundi and many other inshore and offshore species. So fire up Google and start checking out what these destinations have to offer. Even if you don’t have the funds to travel to the far corners of the globe, you can still daydream about it.